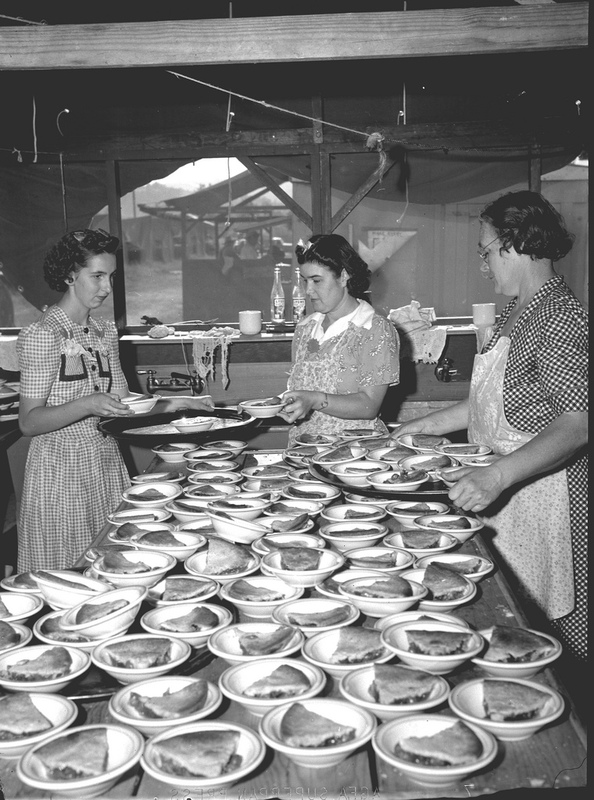 This photo, of women cooks/bakers preparing to serve pie to Mexican workers in Hood River County, Oregon, c. 1943, comes to us by way of the Oregon State University Archives. According to the Archive, almost the entire work force of international migrant workers at that time was composed of over 15,000 young Mexican nationals, who came to the U.S. via the Bracero Program, a WWII era labor initiative between the United States and Mexico. The Braceros, as they were called, were employed on farms and orchards where there were critical labor shortages due to the war. Many faced poor living conditions and suffered from labor disputes and lack of interpreters. When American men returned from the war after 1945, most of these workers lost their jobs and were deported to Mexico. Though Braceros essentially saved American agriculture during WWII, they are generally not recognized for their labor and contribution. Just as I'm curious about the lives of the Braceros, in particular their songs, traditions, and other labor lore, I also wonder who the women in the above photo were--Wives and daughters of Bracero camp managers? Single mothers in need of work? What was there their own work culture, in juxtaposition to those of the Braceros, and what might have been the intersection between those two worlds of Mexican laborers and American women whose husbands or brothers were away at war? And also importantly, what kind of pie is that? Apple, peach, or pear with fruit from the orchard, perhaps? You can see more photos of the series here (though none others contain pie) and read more about the Braceros via Oregon Public Broadcasting here. Also check out Woody Guthrie's song Deportee, which was written about the 1948 death of 28 Braceros who were being deported back to Mexico.